I hope not because I want to win. Anyone want to play a game in this thread? This is how it works. I'll post a pic. The next person posts a pic with something to do with something in the pic I post, the next person posts something to do with something from the previous person's pic. My daughter's goldfish tank, with her betta tank on top. The next person picks something from this picture and posts a picture of their own. tank/goldfish/betta/plants/leaves/cactus/money tree/sunny window/volcano/dragon/rocks/filter/spongebob/pineapple/etc. The only rules are that 3 people in a row can't post a pic of the same thing. Let's say the next person posts a pic of their kid eating a piece of pineapple,the person after that picks anything from that pic to post except pineapple. here's my little monster Tioku at 5 grams he is a MONSTER! Edited February 16, 2016 by Daniel E.
My dogs in a warm load of laundry, including a bunch of squishy fleece socks! There are really no rules set in stone, here. I was just trying to get some action in this thread and thought a game might help. This one was a really long thread in a forum I was on like 10/12 years ago, was kinda fun when people participated. Thought it was worth a try. Dog on the porch with cars and a tree. 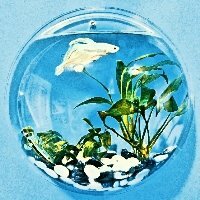 jujube's(rip) tank is made of glass. Cows next to the woods. Can I use trees as plants? Right before Juju passed, I ordered lots more! Love me some marimo! Sadly, can't use it in my 75 because the sand doesn't like it, or is it the other way around? snow and Zoey has the coloring of cows! Oops! I guess the next person can just use either pic since I can't delete. Look on the bright side, More choices! I really wish someone had a pic of ham.